Beavercreek senior Brayden Walther (4) drives in from the corner for a layup against Wayne sophomore Malcolm Curry in their Greater Western Ohio Conference divisional matchup Feb. 1 in Beavercreek. Wayne sophomore Cam Fancher (1) makes a contested layup over Beavercreek junior Mali Harris-Strayhorn, Feb. 1, in a Wayne win at Beavercreek High. 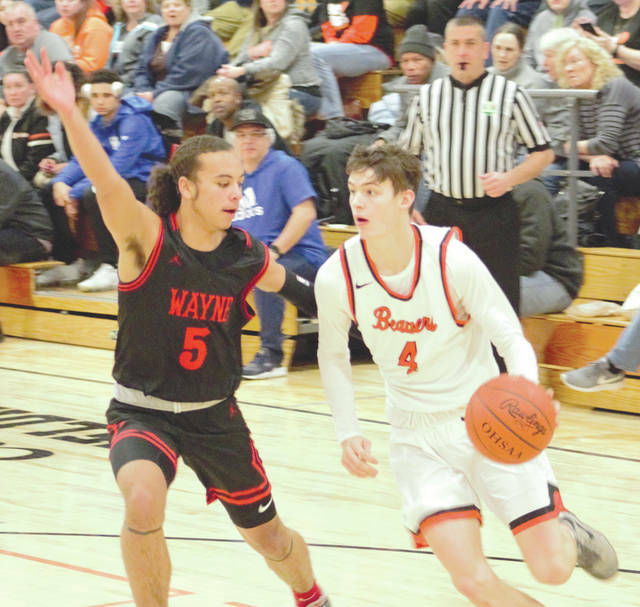 BEAVERCREEK — The Beavercreek Beavers high school boys basketball team fell to 5-12 as they suffered their second loss to Wayne this season. The visiting Warriors advanced to 9-9 as they completed the season sweep with a win by a score of 62-53. The Warriors took a commanding lead of 17 points early in the game as they out muscled the Beavers in rebounding. They also played well defensively holding the Beavers to five points in the second quarter. However, just as the game looked like it would be a blowout, the Beavers came storming back. The Beavers took momentum following halftime and clawed their way back to within six. With the Warriors up 54-48, Martindale took a timeout to try to refocus his team. The Warriors were able to hold their lead and ultimately won by nine down the stretch. The Beavers were disappointed, but it was encouraging for them to fight back. Hampton led the Warriors with 25 points while Chris Herbort led the Beavers with 19. Beavercreek coach Mark Hess had said earlier in the year that their team was young and needed to grow and develop. Hymes said that he has seen this team change and develop throughout the season. For the Warriors, their attention turns to the remainder of the season. Beavercreek’s next game is at 7:30 p.m Tuesday, Feb. 5 at Western Hills in Cincinnati. Wayne’s next game is against Dunbar at 7:30 p.m., on Monday Feb 4. at home. https://www.fairborndailyherald.com/wp-content/uploads/sites/50/2019/02/web1_B4W5_PS.jpgBeavercreek senior Brayden Walther (4) drives in from the corner for a layup against Wayne sophomore Malcolm Curry in their Greater Western Ohio Conference divisional matchup Feb. 1 in Beavercreek. 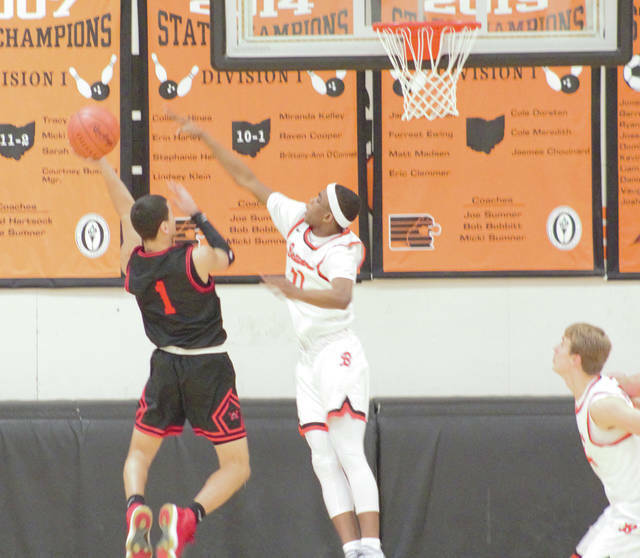 https://www.fairborndailyherald.com/wp-content/uploads/sites/50/2019/02/web1_W1BMHS_PS.jpgWayne sophomore Cam Fancher (1) makes a contested layup over Beavercreek junior Mali Harris-Strayhorn, Feb. 1, in a Wayne win at Beavercreek High.